Mix the milk, cinnamon, pecans and Mexican chocolate in a thick pot. Heat over high heat and use a wooden spoon to stir until the chocolate has completely melted. Continue mixing until the milk begins to boil. Reduce the temperature and gently boil for 5 minutes. Turn off the stove, cover and let rest for 10 minutes. This will allow the pecan to cook and infuse the milk with its rich flavor. If desired, strain, but if you don’t mind the small pieces of pecan, serve as is. Let cool slightly. Serve with ground cinnamon and whipped cream. When it comes to cooling the milk, to save time follow these same instructions, but in place of the 4 cups, use only 2. Once the chocolate has rested and you’ve strained it (if desired), add the additional 2 cups of milk, at room temperature, and serve immediately. If you don’t have cinnamon sticks, substitute with ground cinnamon. Mexican chocolate is almost impossible to resist, especially when served on rainy or cold afternoons. Preparing it is easy, it just takes a little patience, since the secret to good hot chocolate is beating it and letting the flavors slowly dissolve in the milk. I recommend using bars of Mexican chocolate since they’re already sweetened with sugar. You can find them in the Hispanic section of your supermarket. Generally, they come in the shape of a hexagram. 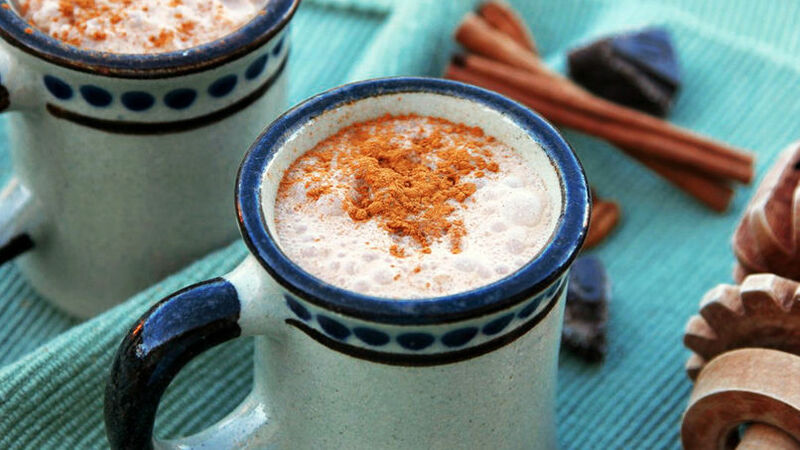 Today’s recipe combines two other flavors, cinnamon and pecans, a delicious spin on the traditional hot Mexican chocolate that we all like so much.